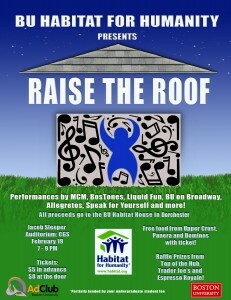 Just a reminder, Raise the Roof is this Friday at 7pm in the Jacob-Sleeper Auditorium in CGS. We’re really looking forward to a great turnout and a fun night, so make sure you get your tickets at the GSU this week, or at the event. The event will feature performances from Mustard Seed, Allegrettos, BU on Broadway, Speak for Yourself, MCM, Liquid Fun, the BosTones, amongst others. Slow Kids at Play will be your emcee for the night. Don’t forget, prizes and free food too. We have two build trips left before Spring Break, one to Greater Boston and one to Merrimack Valley, both are on Saturday the 26th. Other than that, we have a one meeting left before break on Tuesday, the 2nd at 8:00pm. We hope that everyone heading on the Spring Break trip to Florida is getting very excited, you’ll be leaving in nearly two weeks! By habitat | Posted in Misc.